Short press the power button, white indicator lights up means power on, white indicator lights off means power off. 1. Search for the "Smart Life" on the App Store or Google Play. 2. Register/Login to the App using phone number/email address. 3. Get power with your smart socket, short press to power on, and long press 5 seconds until the blue light flashes. 4. Tap "Add Device" or the "+" icon. Select "All" then "Electrical Outlet" and tap "Confirm indicator rapidly blink". 5. Input the WIFI password and then tap "Done". 6. Control the connected devices easily. 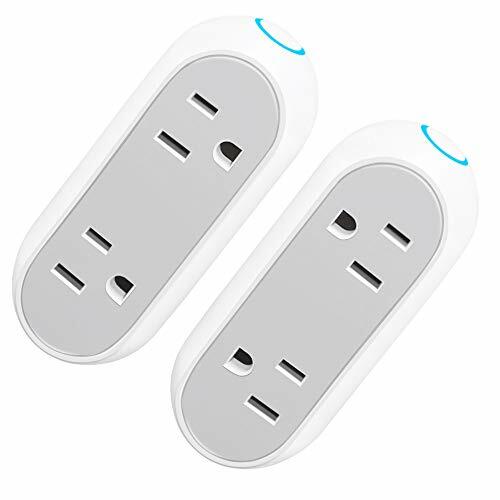 [ Works with Alexa & Google Assistant & IFTTT ] Just download the Smart Life App can control your smart Wi-Fi plug anywhere as you want. Does not support SmartThings and Homekit. Only support one device to control the smart socket at the same time. [ 2-in-1 Design & Independent Control ] Mini dual smart plug can be controlled separately, the ON/OFF buttons on both the left and right side. [ Energy Monitoring & Schedule Timer ] You could also read the energy report via the Smart Life app to track the power usage. Figure out which device consumes the most energy and make a proper improvement to reduce the next electric bill. [ Simple Installation and Stable Connection ] 3 steps to set up Mypre smart plugs. Download the Smart Life app for free in App Store or Google Play, then get power for the smart Wi-Fi plug, enter the wifi password in APP and complete the configuration. Only supports 2.4GHz Wi-Fi network. [ 5-star After-sales Service ] Mypre aims to reach the highest limits of customer service excellence! If there is ANY REASON why you are unhappy or unsatisfied with any of our products, we guarantee you a replacement within 12 months. Please feel free to contact us. If you have any questions about this product by Mypre, contact us by completing and submitting the form below. If you are looking for a specif part number, please include it with your message.